1 Danny and Kinzey needed a new paint set. Their parents would not give them any money. They could not get a job. What should they do? 2 Did they have something to sell? The two children decided to look in the toy box. They looked at every toy. They saw dolls, tea cups, and beads. They saw cars, trucks, and tools. There were many toys, but there were none that they wanted to sell. 3 "We could make something," Danny said. 4 "Like what?" Kinzey asked. "Do you want to make food? Mom makes good bread and muffins. We could bake muffins with Mom's help." 5 "I know!" Danny cried. "We can make pictures! 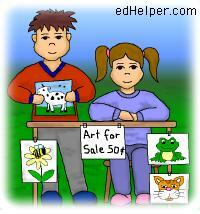 We can sell art!" 6 Kinzey got the desk by the window. Danny sat on the floor. Each one had paper and pencils, but they had to share the paint. 7 Danny began to draw a picture of a cow. He drew an oval for the body. He added four short lines for legs. He drew a curved line for the tail. Then he gave his cow a neck and a head. He put horns on the head. 8 Kinzey drew a bee on a daisy. She drew a six-inch line for the stem of the flower. She drew a small oval for the bee's body. She added three lines on its body and six short lines for legs. Then she was ready to paint. 9 "May I have the black paint, please?" she asked Danny. "My bee needs black stripes."